The Lietzke “BW” Series frames are conventional rebated pressed door frames. 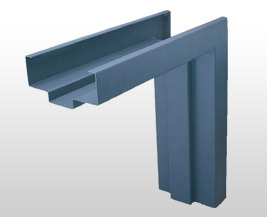 They are designed to suit the wall thickness, door type and door thickness. A pre-hung door unit in a “BW” Frame is either built into the wall during construction or retro-fitted using appropriate fixing methods. This allows all types of architectural door units to be ordered and delivered to site pre-hung in their frames with hardware fitted and finished in a factory controlled environment. The door frames are fabricated by CNC punch press and CNC press brake with mitred and welded corners using Zincanneal or Galvabond steel. This provides a stronger rigid frame which is more aesthetically pleasing to other fabrication techniques. 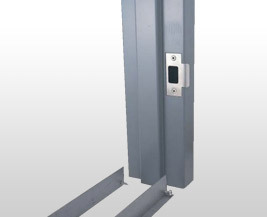 Depending upon the application, frames incorporate mortar guards, hinge plates with self-tapping screws for hinges, stud straps, buffers, wire ties, spreader bars and strike plates. Unless otherwise stated, “BW” Frames are 3-sided with a removable spreader bar fitted. The double rebate allows for either open in or open out door units. Where required, door seals and other accessories are fitted. To match opening requirement and door leaf size i.e. 2040mm H × 820, 870 and 920mm W × 40mm Thick. 2.0mm and 3.0mm Frame Material used in heavy duty applications. Dynabolts or Wire Ties or Stud Straps.